People’s power nabs banksters in their attempted NJ home heist | Fight Back! 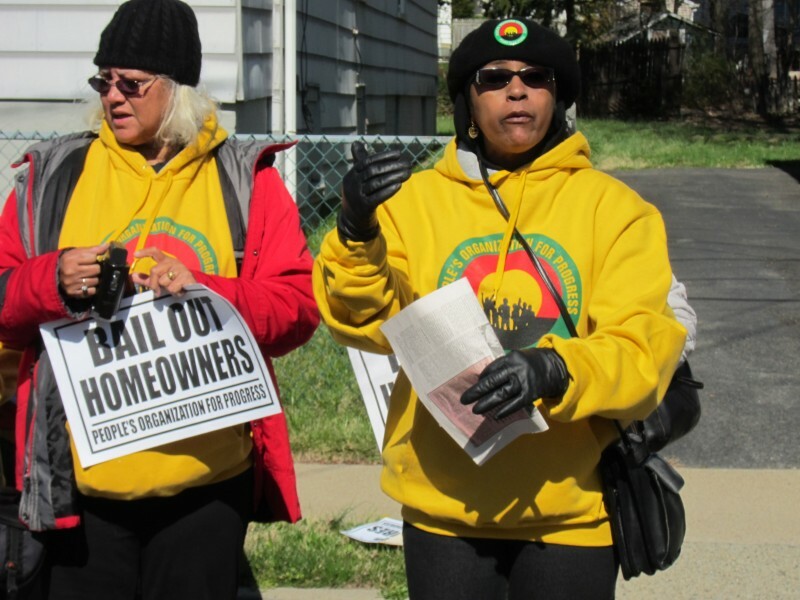 Orange, NJ – On May 4, the fraudulent eviction order against Susie Johnson of Orange was cancelled. The eviction order was for May 10. JP Morgan Chase, named as plaintiff in the eviction, was forced to admit it does not own Ms. Johnson’s mortgage. The cancellation came about because of the power of the people. The struggle shows, and will continue to show, that the power of the people is not just a nice saying. It is a real force in the world. The struggle started with a previous eviction order for March 30. The Coalition to Save Our Homes (C2SOH) issued a call to stop the eviction. Over 30 people turned out from C2SOH, the People’s Organization for Progress, NJ-NOW, Parent Advisory and Student Academy, the New Jersey Industrial Union Council, SEIU Local 1199, CWA Local 1080, Occupy New Brunswick, Occupy Newark and others. The power of the people forced the Sheriff’s office to back off, postponing the eviction to May 10. There is enormous anger at the way banksters have swindled people and forced them out of their homes. On March 30 the Susie Johnson struggle became a focus of the people’s anger. C2SOH already had in progress a protest to demand the Attorney General of New Jersey hear the complaints of victims of predatory lending and prosecute lenders for their many violations of law. On April 11, a working day, 45 people from all over the state, again representing many organizations, went to Trenton in support of our battle-cry: “The banks swindled people! Make them give the money back!” The NAACP provided especially noteworthy support from all over the state. Many victims of predatory lending spoke, including Cynthia Johnson, on behalf of her mother. That day the Susie Johnson struggle made an important step toward becoming a statewide issue. We went to the Hughes Justice Complex to turn in our letter of demands and our petitions to the Attorney General’s office. They would not let us in. We had to give our documents to the State Police. It was as if the Attorney General thought he needed police protection against the people’s just demands. The Attorney General actually helps banksters who break the law. They have no excuse in the world for avoiding their obligations to us, the people. Because of our ongoing work and the power of the people, the New Jersey Department of Community Affairs responded to the case of Susie Johnson when strongly pressed by people’s attorney Bennet Zurofsky. JP Morgan Chase Bank, named as plaintiff on the May 10 eviction order, had to admit in writing to the Department of Community Affairs that it had never owned or managed Susie Johnson’s mortgage. In response, the People’s Organization for Progress swung into action with its hardened protest veterans. On April 28 we exposed Chase Bank, named on the eviction order, with a picket line in front of its Broad Street office. Other members of C2SOH joined in. We really made this culprit feel the heat. On May 3 POP organizationally endorsed civil disobedience for May 10, and noted the names of those who committed to it. At Chairman Lawrence Hamm’s proposal, we set up a daily picket at Wells Fargo, another culprit, vowing to hammer Wells every day with protest until May 10. People’s attorney Michelle Munsat was bearing down on the banks with a court filing on behalf of Susie Johnson. On May 4 the banks’ attorney notified Michelle that the eviction order was cancelled. The banks have no further plans for action at this time. The banks had to admit they were trying to evict someone when they had no proof they own (and doubtless don’t even know themselves who owns) her mortgage. This was a huge setback for them. Millions of people have lost their homes but we stopped this eviction. It is indeed an inspiring victory. At the same time, it shouldn’t be a rarity. It’s the way things should go every day. The Coalition to Save Our Homes will press forward more vigorously than ever its campaign to pressure New Jersey Attorney General Jeffery Chiesa to hear the victims and prosecute predatory lenders for their many violations of law. There are countless issues of economic injustice in this time of crisis and depression. Public schools are being abolished, students are drowning under a mountain of debt, people are denied medical care because they can’t afford it and millions are unemployed. We will work tirelessly with others to build a mighty, united, ongoing people’s movement for economic justice. Power to the people!